Clarion Books, November 2015. 380 pages. Have you ever wondered if dreamcatchers really work? And what would happen if they did? In the world of this book, Sophie’s parents run a Dream Shop in the basement of their used book store. They collect dreams by giving dreamcatchers to people who dream, then distill those dreams into bottles with their skilled use of a dream distiller. They can see what is in the dreams by using their somnium. And then they sell the bottled dreams to special customers who know about the shop. Sophie, however, is the girl from the title. In her twelve years of life, she’s never dreamed on her own. But there was one time she stole a dream and drank what was in a bottle – and the monster she met in the dream befriended her and came to life. 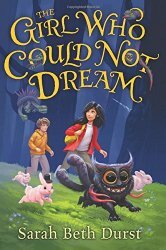 Sophie’s parents let her keep Monster, but they’ve warned her never to drink any more dreams, because there’s no telling what will come out. And if the Night Watchmen find out about her, they would kidnap her and put the shop out of business. People who make dream creatures come to life are dangerous! But then a sinister customer who calls himself Mr. Nightmare comes to the shop and sees Monster. And the next day, she gets a note from him in her locker at school. But it’s when Sophie’s parents disappear – along with two kids from school who used dreamcatchers from the shop – that things really get sinister. Sophie doesn’t dare call the police. The Night Watchmen can’t find out about the shop. Or about her. So it’s up to her and Monster – and a new boy from school she was going to help with nightmares – to find out if the disappearances have to do with Mr. Nightmare. Sophie may need to dream up some more help. I confess, I tend to get hung up on the details of stories where dreams or books come to life, which definitely hurts my suspension of disbelief. I also had trouble with the bad guys’ motivation – why would they turn to crime? And is it really true that the same kids have nightmares over and over? That you could rely on certain kids to supply you with nightmares? I would have thought that some kids have bad dreams more often than others. But every night? So readers who would be bothered by details like that might not be the best audience for the book. However, if you can accept the background of the book – it does contain imaginative details and creative problem-solving that are a whole lot of fun. The Dreamcatcher Bookshop is a cozy place, and it’s nice to read a book where the character has a loving, if a bit quirky, family. And what if you could indeed bottle dreams? Would any of your own dreams be marketable? Which dreams would you want to catch and dispose of? And how would you fight nightmares come to life? I love Sarah Beth Durst’s teen fiction, and this book for children has her trademark imagination along with likable characters you want to spend time with. Source: This review is based on an advance reader copy sent to me by the publisher at the author’s request. G. P. Putnam’s Sons, 2015. 404 pages. 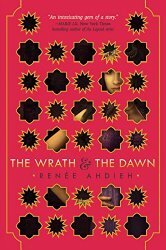 The Wrath and the Dawn is a reimagining of the story of The Arabian Nights, and I’ll warn the reader right up front that it’s only the first volume of that story. Shahrzad has volunteered to marry the caliph who keeps killing off his wives. She plans to avenge the death of her best friend, Shiva. She begins by telling him a story, a story that she will continue the next night. She is planning to find his weakness and kill him, but things don’t turn out as they expect. And the caliph is not the monster she had thought him. And her childhood sweetheart, planning to rescue her, as well as her father, accessing magic, all do not understand the changes that happen in her. Let me say first that there are some holes in this story. Given the reason we find out for the caliph’s murders, I have a hard time believing that Shahrzad would really have lasted past even the first night. And then the way magic works is very vague and feelings-oriented (which I never particularly like in a fantasy book). On top of that, we’re told that Shazi is determined and does what she sets out to do – It seems to me she would have had a plan for killing the caliph and would have put it in place the first night, rather than hoping to arouse his curiosity. But that said, this is an absorbing and fascinating love story. I’m not sure that I *quite* believe, once I think about it, that they would fall in love with each other. But while I was reading it, I didn’t think about it and was wrapped up in the story and longing for them to really see each other. So, yes, there are some hanging plot threads. But the book is worth it and the story is lovely and I will definitely want to read the next installment. Perhaps not with the urgency that would keep my bride alive if I were an evil murdering caliph, but I’ll definitely be reading the next book soon after it’s published. Albert Whitman & Company, Chicago, Illinois, 2015. 32 pages. 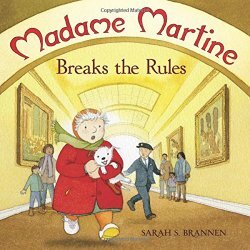 Madame Martine Breaks the Rules features the same lady who lives in Paris with her dog, Max, whom we met in Madame Martine. As at the end of Madame Martine, she wears a bright red coat and every Saturday tries new things. 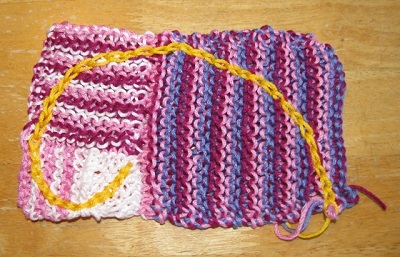 Her friend, Louis, often meets her at the café where she always has breakfast. He is a guard at the Louvre Museum and invites her to visit. “For you and Max, we might break the rules,” said Louis. Madame Martine was shocked. “We would never ask you to do that!” she said. But no one told Max. Later, when Madame Martine is talking with Louis near the Louvre, Max dashes in through the employee entrance. They end up getting a tour after all. 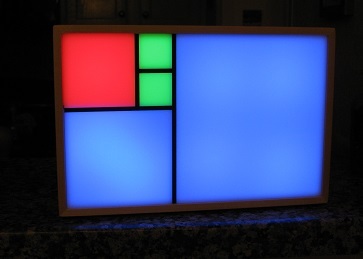 It turns out that rules can be bent for friends of Louis. This book isn’t as inspirational as Madame Martine, since the message of trying something new is much more uplifting than a message that rules can be bent. However, like Madame Martine, lovers of Paris will love this book. The art takes us on our own small tour of the Louvre. This is a quiet book about our friend Madame Martine, and her little dog Max who again knows how to find wonderful things in the beautiful city of Paris. You are currently browsing the Sonderbooks blog archives for November, 2015.